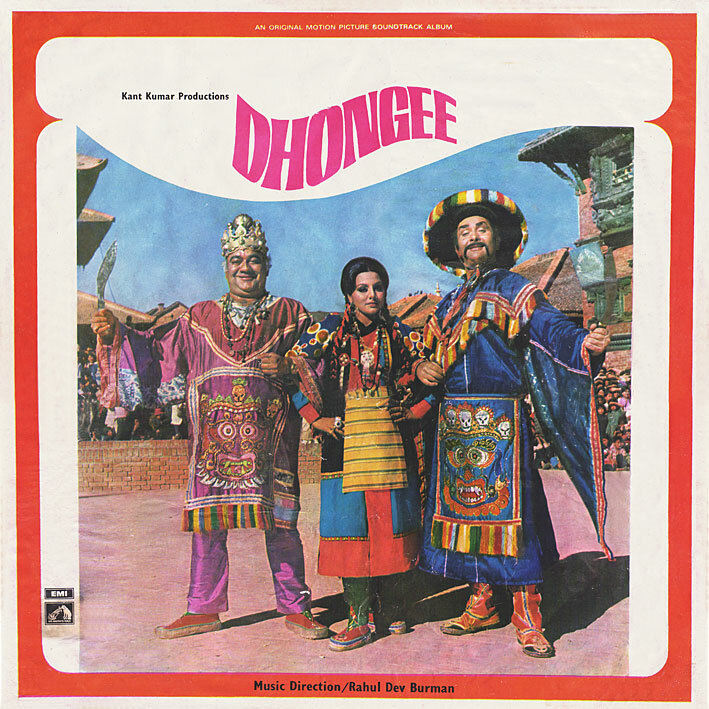 Following on from last week's Burman soundtracks that weren't very good, here's one that is... with apologies for the delay to whoever it was I promised 'Dhongee' more than a year ago. Two tracks highlight this score, 'Dil Chhina Chain Churaya' and 'Hai Re Hai Tera Ghunghta'. Both are drum/percussion based, very rhythmic (syncopated and tribal sounding respectively), giving them a more ethnic feel than a lot of R.D's output from the period (the stuff I tend to like anyway)... heavy grooves. With plenty of tasty details in the arrangements to flesh them out; excellent stuff indeed, worth grabbing. (Meri Bahena O Meri Bahena' and 'One, Two, Three, Go' are also nice). I remember almost passing up on this LP when I first came across it; the cover was a bit tattered. I'm glad I reconsidered... especially since it hardly ever turns up anymore. Let me be the first to say thank you for this rare gem! You are awesome! Thanks, pc. I got the DVD of this movie just to hear these songs (and was disappointed to find out that "One two three go" was left out!) Now I can finally discard those MP3s for some nice vinyl rips. My ears thank you, pc! Not to mention DVD authors could get really stingy sometimes and chop entire scenes and songs out (The Burning Train is a shining example, one company released a DVD that's over 40 minutes longer than the actual film distributor's DVD). Bollywood is really weird sometimes! Hey, any chance you have the soundtrack for "Disco Dancing"? It's supposed to have the original version of M.I.A. 's "Jimmy". It'd be great to hear it. Don't have it I'm afraid, but the song in question was posted under the comments to this post. Tribal Burman what a combo !!! so glad that there is so much info here about these classic recordings + films.. thank you PC-- and thank you everyone else here for the additional info and links..
hey pc sorry for the shameless plug, but if you guys want disco dancer, i'll post it by the end of the day on my blog http://curry-queen.blogspot.com/....so check it out! Thanks once again, and also to all those adding information and their own uploads!
" I really thought of thanking you with a little surprise and thought it would be better than a mere thanks. " Can't go wrong with RD Burman! Thanks!